That only took a few years. 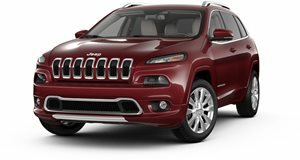 When it was launched in 2014, pretty much everyone said the same thing about the Jeep Cherokee’s front end styling: it looked way too weird. Jump ahead a few years to the Cherokee’s upcoming mid-life makeover, and that supposedly quirky styling hasn’t aged particularly well, something Jeep designers had hoped would happen. Consider that a lesson learned because we’re hearing reports that Jeep is going with a more traditional Cherokee schnauz that’ll be more reminiscent of the new Compass and Grand Cherokee. The facelifted Cherokee itself isn’t due to arrive until the 2018 model year, but we figure it’ll have its live debut next January at Detroit. Specifically, the 2018 Cherokee will ditch the separated daytime running lights and main projectors, and instead will be combined into a single unit. The must-have seven-slot grille will remain. Additional updates may include an expanded assortment of electronic driver aids, further calibration refinements to the nine-speed automatic transmission and maybe, just maybe, a high-performance Trackhawk trim. If that were to materialize, a fairly good engine guess would be a tuned version of the current 3.2-liter V6, which makes 271 hp. More details will come in throughout the summer and fall.